After a number of ‘Psyche Power Hour!’ shows all in a row, Live Psyche Out! 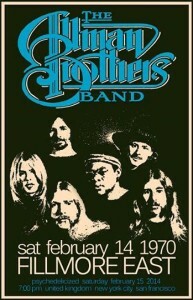 is back, with The Allman Brothers Band live on Valentine’s Day 1970 at the Fillmore East! Yes, you see the connection there, it’s the day after Smoochfest. So, come shake your southern dangler along to the celestial sounds of The Allman Brothers, this Saturday night, only on Psychedelicized Radio! Saturday 15th February 7pm UK, NY and SF. Be there or be cursed! Thanks to Rusty and Whitebread for bringing this to the table.